Disable WhatsApp Calling – WhatsApp calling is a great feature of WhatsApp and it turned out to be one the most break through features of WhastApp till date. WhastApp is updating it’s features regularly and trying to make a mark to its honest users but apart from the chat feature calling is the most useful feature WhatsApp came with. As I told you it’s a great feature but a huge part of WhatsApp community doesn’t feel that the feature is relevant, it sometimes becomes very annoying because people constantly call you because it’s completely free. It becomes the most annoying when you are online doing something important and the disturbance which is occurred completely distracts you. For most of the people, it’s very useful to call in an emergency when you’re out talk-time but it’s full of pros and cons. Now here I have got a break through for all those people who don’t want WhatsApp calling feature at all and they want to shut it down. 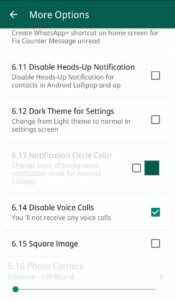 You will be easily able to disable the WhatsApp calling feature without any hassle but as I told you earlier if you want to disable WhatsApp calling forever has its own pros and cons. It can be very beneficial for you in terms of maintaining your peace when you are busy online and let you do something productive out of it. Below I have shared the easiest methods through simple steps to disable WhatsApp calling permanently. For the first method, we are going to use an Application called WA Tweaks. It is is a very unique Application using which you can squeeze out the hidden tricks and features inside WhatsApp which were unseen and hidden from everyone around. It is designed as a well known developer team named Alex193a. 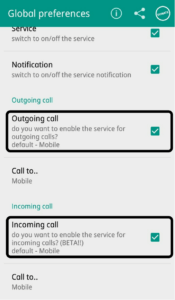 Let’s get to the steps to use WA Tweaks to Whatsapp calling in Android. 2. First of all, turn the Airplane mode on your smartphone. 3. Then you have to go Settings >Apps > WhatsApp and click on Force stop to temporarily stop WhatsApp. 4. Now get back and open the WA Tweaks Application. And then click on the option called “Extra”. 5. Once, you click on “Extra”, you will see an option called Disable Voice and Audio calls, just click on that and turn that mode off. 6. That’s it, all you have to do is turn the Airplane mode on and your calling feature on WhatsApp will be disabled completely. As you have done this process anyone trying to call you on WhatsApp will receive an error while calling you and your privacy and peace wouldn’t be hurt anymore. 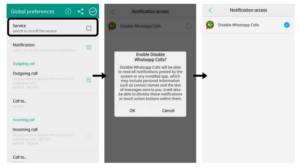 In this method we gonna disable WhatsApp calling by using an App called “Disable WhatsApp Calls”. 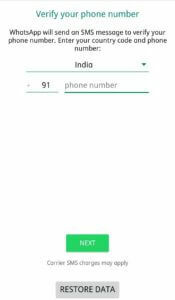 This is the best rated App to disable WhatsApp calling in Android. The key feature of this App is it doesn’t need root, yes you heard it right you can use this App even if your Android is not Rooted. Previously this App was on Google Playstore but because of violation of WhatsApp terms and condition now it is removed from there. But don’t worry we have shared the mirror link below. 2. Now open the App and click on “Service” then select “Disable WhatsApp Call and finally click on “OK”. 3. Then select the Incoming call and Outgoing call option. You can also choose only Incoming call and keep outgoing calls on, it depends on your choice. 4. That’s it you are done, all of your incoming WhatsApp calls will be automatically disconnected. The only disadvantage of this App is it sometimes stop working. So if this happens to you then I will recommend you to go for method 2. 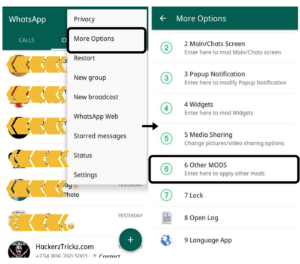 In this method, we will use WhatsApp Plus App to disable WhatsApp calling. Before few months WhatsApp started blocking WhatsApp Plus users but I don’t worry, here we have placed Antiban version of WhatsApp Plus. If you use this version of WhatsApp Plus your account will not ban. Even I am using this App from last 3 months and I have never faced any issues of getting a ban. 1. Firstly, take the backup of your WhatsApp chat from Settings > Chats > Backup. 2. Download & Install WhatsApp Plus Antiban in your Android smartphone. 3. Now the open the App and agree their terms & condition then finally enter your mobile number. 4. Now enter the OTP which you will receive in the mentioned number. 5. Then restore your chats backup and wait till it’s complete its process. 6. After completing the sign up process click on three dots “⋮” which is located on the top right corner of the App. 7. Then click on “More Options” > Other Mods. 8. Now go to the bottom of the page and click on “Disable Voice Calls”. 9. This is it! You have successfully disabled WhatsApp calls. Hence, I showed 2 methods to disable WhatsApp calls. Both methods are fully working and don’t need Root access. 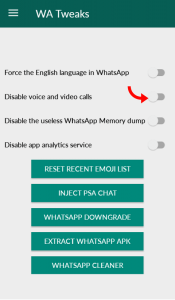 Below I have shared the steps to disable WhatsApp call for a particular contact. This feature is most useful when someone in your WhatsApp contact is troubling you by calling simultaneously. Instead of disabling the feature completely, you can just use it for any particular contact. Here are the steps. 1. Open WhatsApp Plus Antiban and select the contact you want to block. 2. Then go to their profile by click on the name. 3. Now click on “Custom Notification” and enable “Use Custom Notification” option. 4. Afterward, under the “Call Notifications” section click on “Disable Voice Call” option. 5. Hurray! Now you won’t receive any call from that contact. Having explained all that, I don’t any problem with the WhatsApp calling feature. The reason of posting this article is just to help those who don’t find it useful. The article is focused on people who don’t find the feature relevant and want to remove it from their WhatsApp account. However, I believe the feature is a very good take of WhatsApp to compete with other social media giants who are trying to steal the market share from it. As I told you guys earlier that this article is very beneficial for people who are concerned about WhatsApp calling at all. It will make your online life peaceful and less disturbing, it may have some pros and some cons also but the end of the day you’ll love it. Hope you like our guide about disable WhatsApp calling. So, hence was the post to disable WhatsApp calling by three different methods. I hope you liked the post. Feel free to comment your reviews in the comment box.